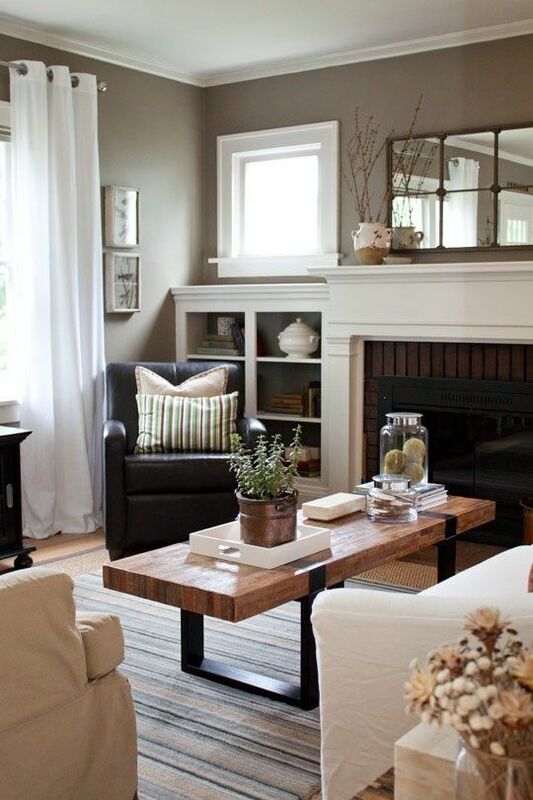 In this post, I’m going to share some living room images that I think really work well for sale time; they are neutral, but they have enough about them to inspire warm, fuzzy feelings in many buyers. Hopefully, these designs will show you that ‘neutral’ doesn’t have to mean boring. Take this gorgeous ‘greige’ wall colour – it’s a cross between grey and beige, and I think it’s beautiful. It isn’t a pale, apologetic colour; it has character. It isn’t the equivalent of walking into a party and shouting to announce that you’ve arrived, like a bright pink wall; rather, it’s the calm, assured lady in the corner who draws no attention to herself yet everyone in that room knows she’s royalty. I might be getting a bit wordy here, but do you see my point?! This colour is a confident backdrop for the rest of the very neutral colours in the room. Plenty of white (in the curtains, ceiling, sofa, mantelpiece and other woodwork) keeps the look bright and fresh and stops the colour feeling too dark and the room appearing smaller than it actually is. The dark leather chair and wooden furnishings give the room the grounding elements it needs that are also warm, stopping the room appearing too stark and cold. All in all, it’s a really gorgeous room that most people would struggle to ‘hate’, and it wouldn’t be nearly as fabulous if the walls were painted in magnolia. Trust me, it just wouldn’t work if they were. Next up we have a similar wall colour, but this one is more of a blue-grey. There are many of the same elements to this scheme as the first; the white ceiling and window surround, along with the warmth of the wooden floor. 10% is that mustard yellow accent colour in the cushion and frame to the left of the shelf. It’s just enough to draw your eye and lift the scheme. Creamy beige wall colour can look good, but you’re advised to add at least some colour for contrast and distinction. Here’s another neutral wall colour, this time a fairly standard creamy beige. I’ve included it to show how you can liven up these very neutral colours. The soft green sofa is very tonal with the wall colour, the rug and the wooden table but it gives you something to look at. If the sofa too was cream or beige, there would be no distinction in the scheme and it wouldn’t look nearly as good. Here, the photo frames also provide interest but it’s been cleverly done with the same colour frames and purely black&white or sepia artwork so there isn’t a big confusing mess to look at. This is important when you’re selling, as buyers should be looking at the room as a whole and not your photo collection. Everything is tonal here; the greens, browns and white. The accent is simply the brighter green leaves. 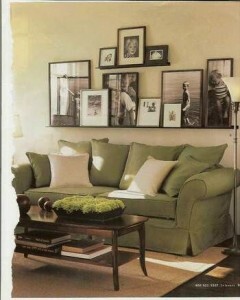 Let’s see that sage green on the wall now instead of on the sofa. I love this room; it’s very grown-up and aspirational, and while there is a fair amount of stuff in this room, every single item is doing its job to make you want to live in this room. Granted you can’t see much of the sage wall colour here, but it does set the tone for the entire room. The large mirror reflects lots of light from the window and the white sofa keeps things bright along with the floor lamp and candles. The wooden elements are all of a very similar tone so nothing really stands out overtly. There is an accent colour, but rather than being a different colour than the green, brown and white already used, it’s just the much more vibrant green of the leaves. The sofa is the brightest part of the image so that’s where your eye goes. I don’t know about you, but my eye is drawn right to that empty spot on the sofa, next to the cosy rug and the comfy cushion, where I’d really like to curl up with a book and a cuppa. Now *that’s* an aspirational lifestyle photo, and this is the sort of feeling you should be aiming to elicit in your own buyers. Really! You’ve got to make them feel something, and that something is desire, simple as that.